Just got back from a 3 day wood turning class at Jimmy Clewes studio in Las Vegas. If you are a beginner (like me), take the class! If you have some experience take the class! If you are an expert take the class! Not only does Jimmy know what he is doing technically, he has an extraordinary eye for the creative side of wood turning. On top of that, he is a great teacher, and teaches hands on. Jimmy has infinite patience (and he needed it trying to get me going, but it worked). I went to the class expecting to get grounded in the basics. Do lots of repetitive exercises under Jimmy’s supervision so that I could come back home and start some simple projects. 1) 9 inch Ambrosia Maple bowl. In doing the projects I learned the basics and had fun at the same time. All 4 projects were completed and are displayed in a place of honor at my house. Unfortunately the 3 days went by too fast. So, I am planning to go back in May for 3 more days. As a bonus you get 3 great home-cooked lunches, and unlimited (and I mean unlimited) cups of tea.Thanks Jimmy, best money I have ever spent. See you in May – put the kettle on. Thank you for hosting us during the holiday break for a father and son class. You have given Karter a tremendous amount of pride and confidence. The first thing he did when he got home was display his hat, lidded bowl and signed DVDs. Thank you, Mary for taking the time to talk to us in Phoenix and helping arrange the class. We cannot thank you enough. Jimmy – got back home to the chilling 20’s and 30’s here, but always good to be back home. I wanted to say a special thanks for your hospitality and the wonderful 3 days. I am not easy to please, nor am I bashful in evaluation but I can honestly say that the entire experience was great. There is not one single thing that I could even suggest to improve upon the time spent. I will definitely be back but hope that will be after your time here next year. Thanks again for an absolutely great time & we’ll see you again next year. I just wanted to say that I found out about you from Bob Stewart. I know he took a seminar at your shop and he brings you to his woodturning club in Texas. When I heard your name mentioned, I did an internet search and found all of your DVD’s. What a treat!! I am learning a ton and really enjoying it. I have been woodturning pens/bottle stoppers etc for a few years, but have a ton to learn. ..your DVD’s are a Godsend! I bought them all and am about 1/3 of the way through them. I am setting it up to turn some larger projects hopefully. Anyway, I just had to tell you that I appreciate the effort and time that you put into these DVD’s for myself and others to learn from you!! Thank you! I wanted to thank you again for the wonderful turning experience you provided to us last week. Your combination of knowledge, expertise, humility and patience made my experience most rewarding. 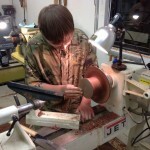 I hope I can find a time to come to your shop in Las Vegas in the next year or so to further my woodturning education. Thanks again for the fabulous class — without a doubt, the best three days of turning instruction I’ve ever had. My wife was blown away by the pieces that we made, and I definitely feel like you’ve helped me take my craft to a new level. Every aspect of the experience was perfect — the shop set up, the amount of time we spent each day, and the delicious and relaxing lunches. And getting to meet Mary was an added bonus. I can’t wait until our March turners club meeting so I can put my pieces on the show-and-tell table and share them with the rest of our folks, along with a hearty endorsement for attending one of your future classes. And I’ll put a testimonial in our next club newsletter, as well as a personal review on your website. I just wanted to take a moment to thank you for an outstanding 3 days last week. Dave, Wayne and I are getting together this Friday to have a session and see how much of what you taught us we can remember. I think we will do well. I have said it before that you are an outstanding turner, however, you are an even better teacher. Your turning techniques are easy to follow and your assistance in getting us to be able to properly apply the techniques was excellent. You make everybody feel at ease no matter their skill level. Also thank Mary for preparing our lunches and for so graciously opening your home to us. The lunches were excellent.